Vegetarian, creamy and hearty—cheese-broc rules! 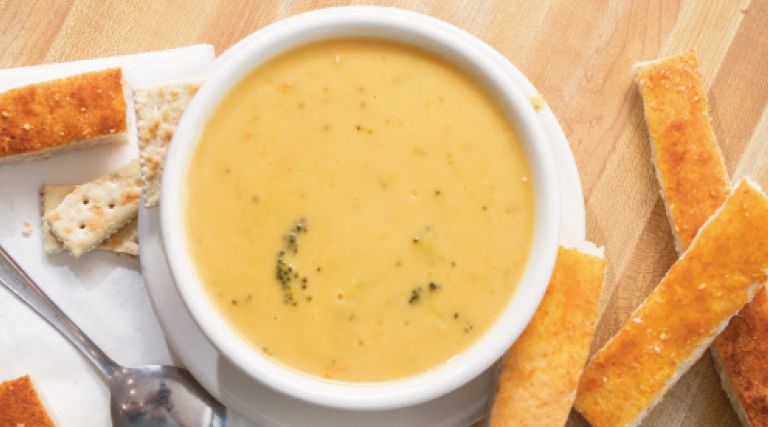 Among the Soup Kitchen’s seven daily soup offerings, one of its most popular is the cheese broccoli. During the restaurant’s busy (read: coldest) season, employees make 45 gallons per day of this soup in large vats at their 600 North location, which is shipped every morning to the other three locations around the Salt Lake Valley. Here is a pared-down version to make in the comfort of your own home. Create a roux to serve as a soup base. Heat pot to a consistent medium (or medium-high) temperature. Melt ¼ cup of butter and approximately 2 cups of flour and add 1 teaspoon salt. Consistently stir flour-and-butter mixture for up to 10 minutes. Adjust butter-flour ratio as needed. If flour starts burning, the roux is no good. Slowly add shredded cheddar cheese to mixture, followed by cheese-sauce mix while continuing to stir. (Note: If you do not mix cheese in well, it will stick to the pot and harden.) For a thicker base, add more flour to cheese mixture. Cook cheese mixture for 30-45 minutes until cheese has broken down, then simmer. Meanwhile, boil water in a separate pot large enough to accommodate vegetables with 1 teaspoon salt and chicken bullion, if desired, for extra flavor. Once water is boiling, add carrots and broccoli to water and parboil (partially cook) the veggies; don’t overcook as vegetables will continue cooking once added to cheese mixture. Once the cheese base has cooked and reached desired thickness, add vegetables to mixture, as well as some water, as desired, to achieve silky smooth consistency. Heat through and simmer for several minutes before serving. Enjoy!